What does the brass letter "A" stand for or mean worn on the shoulder of the uniform or over a WW1 Australian Soldier's arm battalion colour patch? Birdwood also liked the idea of some distinction to be worn by Anzac veterans. In August 1916 he told all five divisions that a brass “A” could be worn on the colour shoulder patch. Formal adoption was made in AIF Order No 937 (November 1917) and later orders made the wearing of the “A” compulsory and laid down the strict eligibility rules. Initially, there was some resentment especially from soldiers who had taken part in the hell of Pozieres or other Western Front battles. They felt that their suffering was far greater when compared to the Gallipoli campaign but were not being acknowledged. 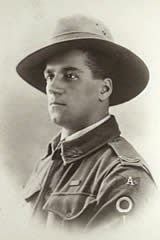 The brass “A” was also respected as it showed a long serving member of the AIF. The “A” identified or represented an experienced combatant, someone who could be relied upon by new soldiers to the front. As the war dragged on into 1918 the numbers of Anzac veterans in the field reduced due to casualty/illness attrition. Fellow soldiers also felt sorrow when an “A” man was ‘knocked’ after all the years of front-line service. What is Australia's Oldest WW1 Memorial?